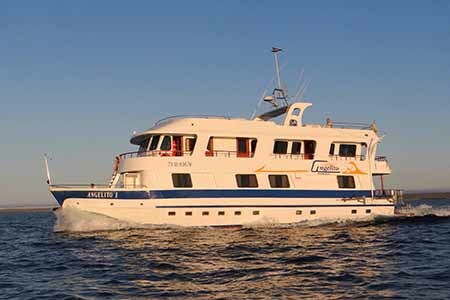 The Angelito always cruises with one of her owners at the helm, ensuring a quality experience for her guests. 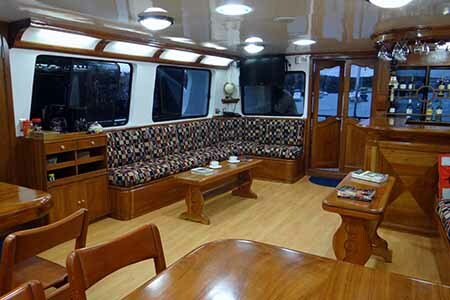 She has four sundecks that serve as patios, an elegant and well-lit dining deck with a bar, and a handsome wooden interior. 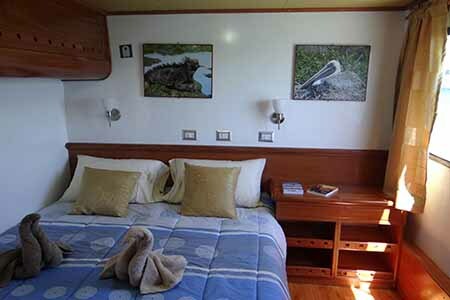 Each of the eight fully air-conditioned cabins has a private bathroom, complete with hot shower, and comfortably accommodates guests twin berths. 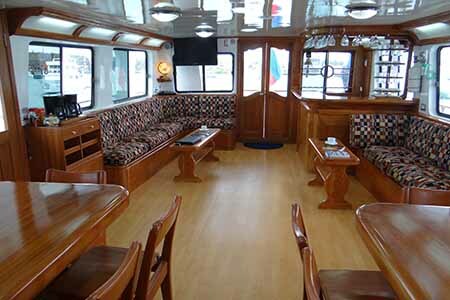 You won't feel rushed on the Angelito, as quality of interaction is prioritized over quantity of islands visited. In addition, each day is well planned to ensure a superior experience. • Children under 12 years, have 20% off over rack rate. 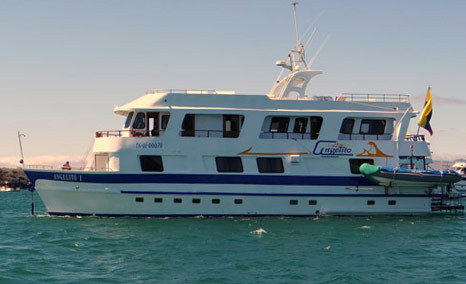 Please ask your Trip advisor for information on 11-Day, 12-Day, 15-Day Cruise itineraries for this boat. 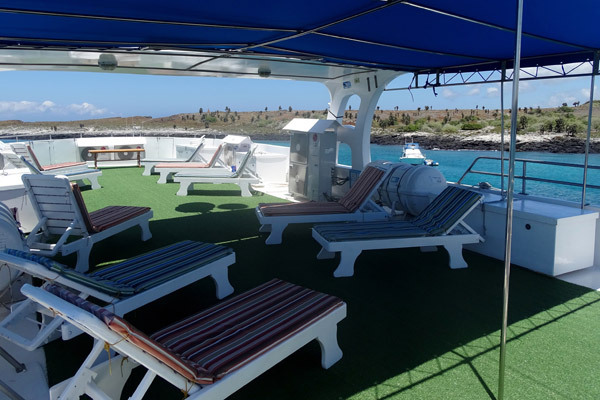 We are sending you a quick note to tell you how much we loved our cruise on the Angelito (28 September-5 October). We have just arrived home after nearly 3 months travelling around South America, and definitely thought our Galapagos trip was a highlight. The boat, the crew and the food were all wonderful and of course the amazing animals and scenery were so memorable. We would recommend the trip to anyone. Thank you again for your assistance with the organisation and booking- everything went according to plan and all of our transfers and connections were on time and without fuss! 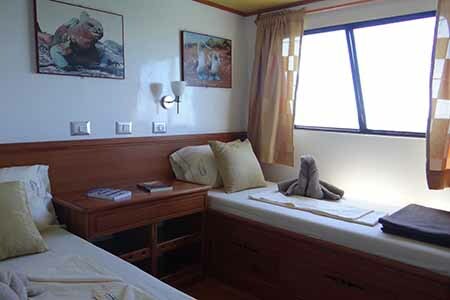 The cruise in the Galapagos on the Angelito was wonderful. The accommodations, food, itinerary and crew were excellent. We would highly recommend the same trip to others. The stay in the Vieja Cuba however was not as pleasant. The hotel is very cute and clean, and the staff was very polite. However, the hotel is very loud! We recommend that the hotel post signs instructing guests and staff to "please be quiet - guests are sleeping" (maybe 11pm - 6am). This would certainly help to make the hotel more enjoyable. We unfortunately did not rest well either night at the hotel due to loud guests late in the evening (after 2am. ), and loud staff in the morning. We would not recommend the Viejo Cuba hotel. Thank you for all of the arrangements. If we return to the Galapagos we will contact you again Smile.